I love you Kim! You made so many spot-on, eloquent, well said comments! I am so tired of it always being about the money. I do not think Mr Deary really has serious financial problems, but obviously he thinks he is entitled to more. It's always nice when famous and influential people have morals, and use their prestige to be role models for children. However, that is rarely the case. Also, greatpoint about J. K. Rowling, and I loved your wit, humor, and sarcasm! 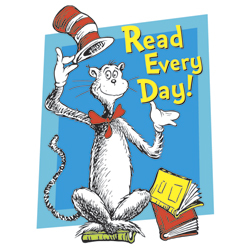 Dr. Suess is a classic and it's always a great and FUN read! I am waiting to hear the story about your Mama as well. :) Love you again, and thank you for speaking out!